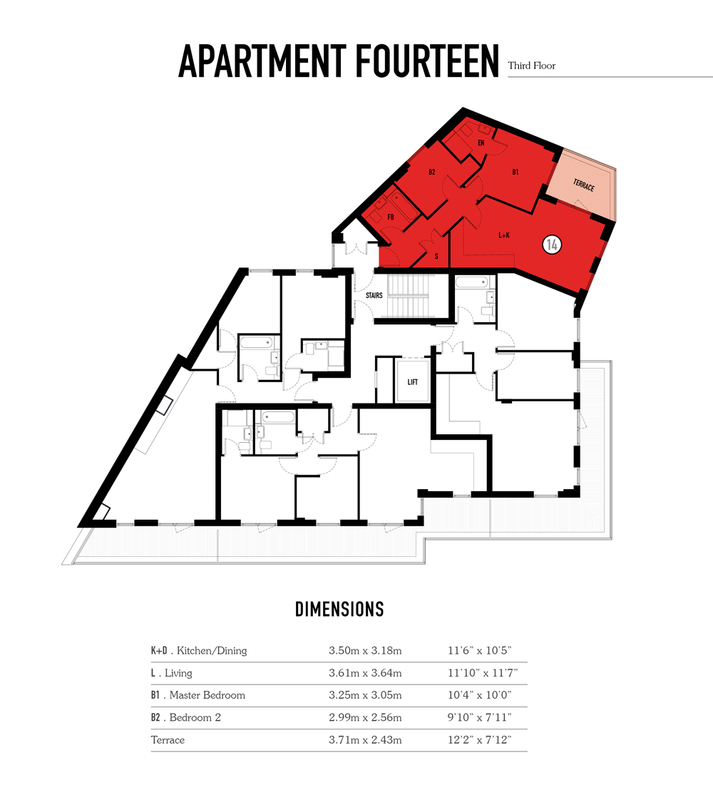 A collection of 14 studio, one and two bedroom apartments in a prime high street location. 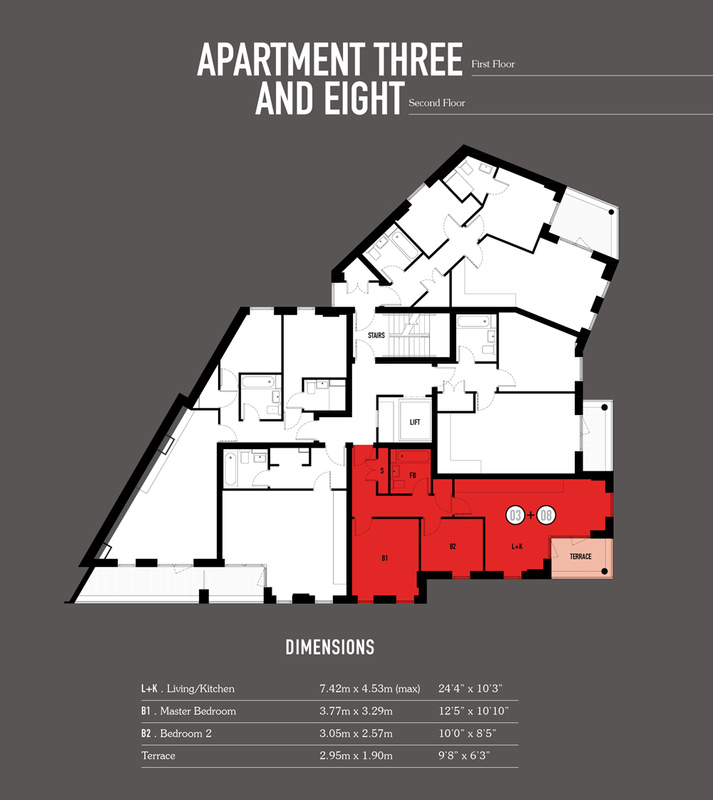 When purchasing a new home at Triumph House, you are securing yourself a piece of local history. For many years the unit on the ground floor was run as a motorcycle shop - a heritage we have tried to reflect, not least in the scheme’s name. Dating back as far as the early 1900s, local company Whitby’s ran its dealership from here, and was one of the largest Triumph and BSA distributors in the South East. The premises were then purchased and run by motorcycle enthusiasts and racing legends Brian Hunter and Tom Dickie. The pair successfully operated from here for a number of decades, whilst pursuing successful racing careers. Both famous within the motor racing circuit in the sixties and seventies, the pair notched up some considerable successes. Not least, in 1966 Tom Dickie won the Manx Grand Prix, before going on to win the 24-hour endurance race the Bol d’Or in 1970. In addition to competing alongside his friend and colleague, in May 1969 Brian (pictured) added another accolade to his name. Brian played his part in the Trans-Atlantic Air Race between London and New York, transporting the eventual winner for the UK leg of the race on his Triumph Tiger 110. An emerging part west London, Acton offers its residents quick and direct access into the city, while the neighbouring towns of Chiswick, Ealing and Shepherds Bush are all within easy reach. The area boasts an array of individual high streets, offering everything from independent cafés and coffee shops to florists, bakeries and small supermarkets. Step out of your front door and you will find yourself on Acton High Street, which offers the convenience of a large supermarket, coupled with an array of local independents. 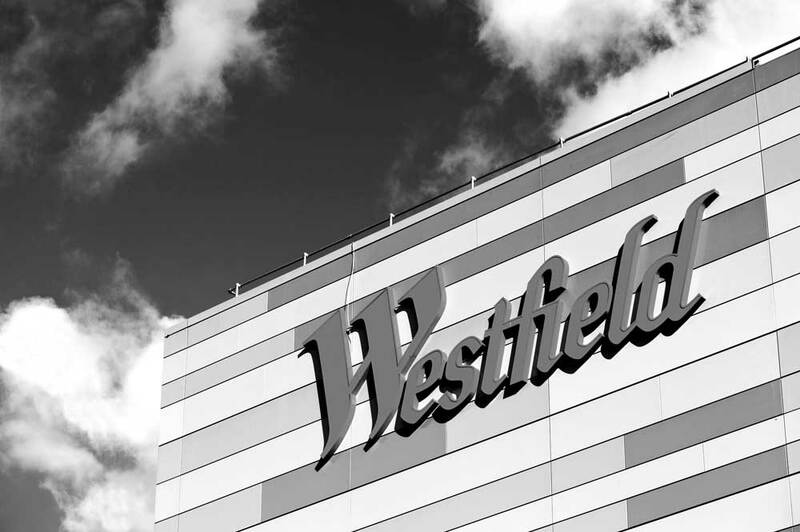 For those in search of high fashion and a true retail experience, then look no further than Westfield London - one of the UK’s premier shopping destinations. Here you will find everything from designer brands to high street favourites, along with a wide range of bars and restaurants - plenty to keep you occupied. In Acton itself you will find a broad selection of cafés and gastro pubs. 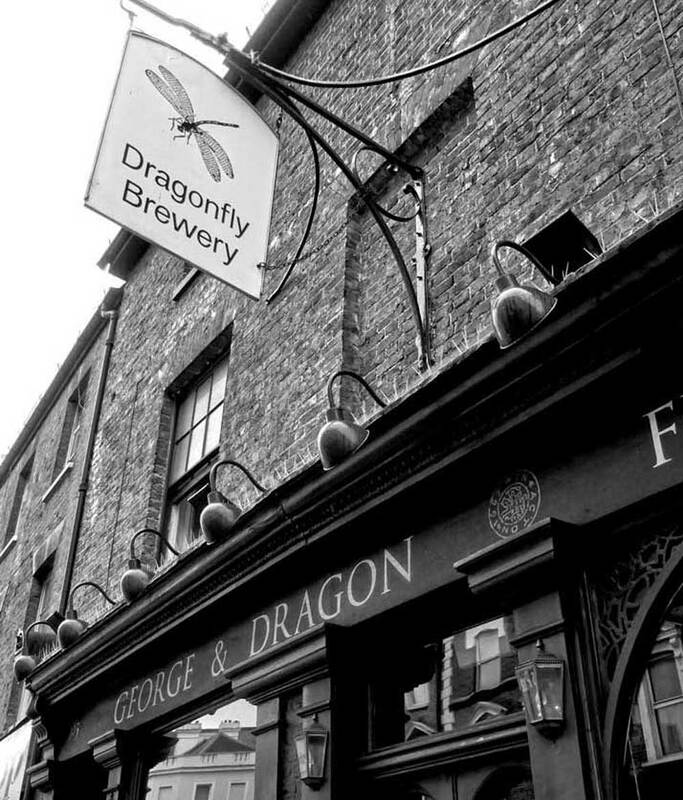 Local favourites include the George and Dragon, which boasts its very own microbrewery. Other well-loved haunts include The Rocket, which offers a tempting menu of British classics, or why not try The Station House Pub and Dining Room with its cosy interiors and extensive beer garden. If you are looking for a true, foodie destination then neighbouring Chiswick will not disappoint. From its two Michelin star restaurants (Hedone and La Trompette) to an impressive number of bistros and brasseries, you will have trouble deciding where to visit first. 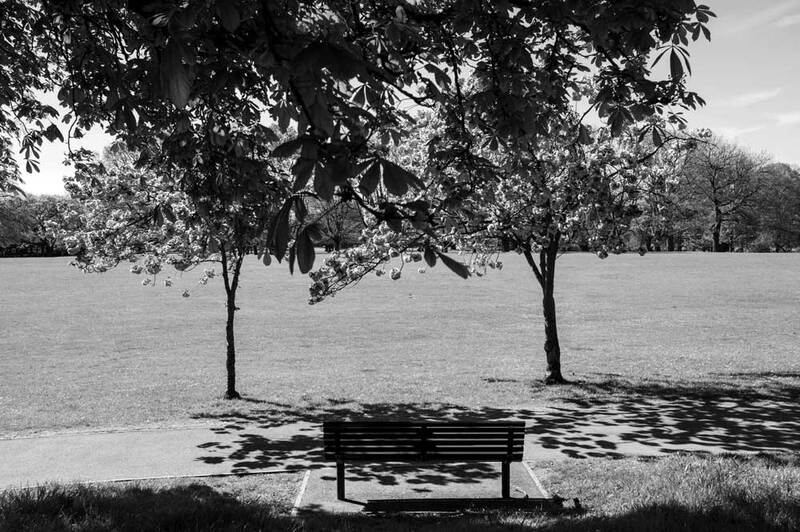 Residents in this part of London are spoilt with the many parks and green open spaces available to them. 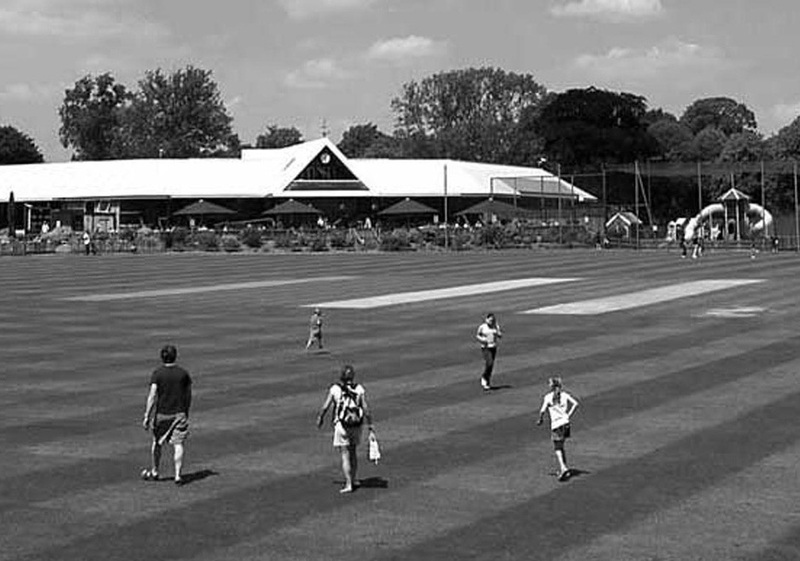 Whether it’s a game of tennis or making use of the putting green in Acton Park or participating in the ‘park run’ at Gunnersbury Park, there is plenty to see and do. The area also benefits from a large number of gym and leisure amenities, including The Park Club (which remains open but is currently undergoing an £8m refurbishment), along with the Everyone Active Acton Centre, a fantastic facility that boasts a 100 station gym as well as swimming pools, dance studios and its own library. Acton means "oak farm" or "farm by oak trees"
Westfield London is a shopping centre in White City, London. At The George & Dragon is a brewery and gastropub serving home-brewed craft beer, headed up by the young, dynamic and award-winning Master Brewer, Conor Donoghue. 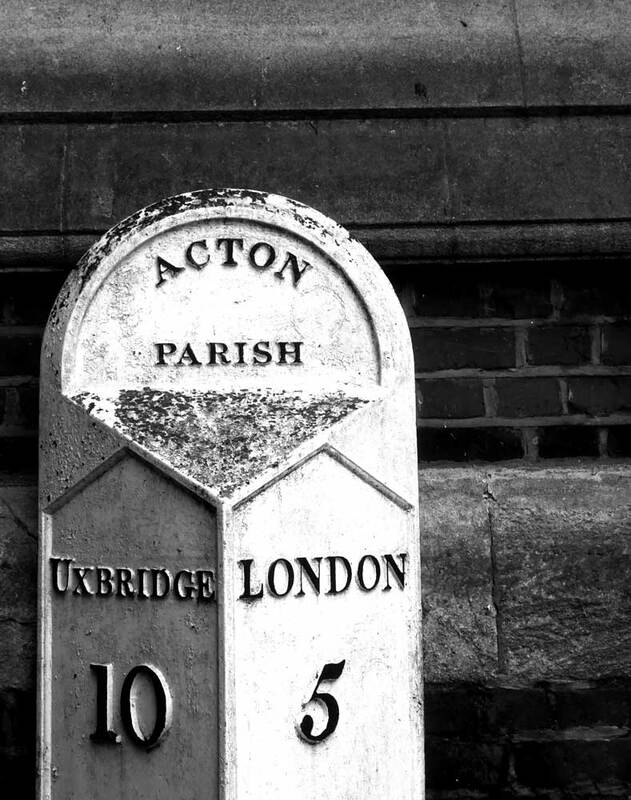 In 1865 the Local Government Act 1858 was adopted by the parish of Acton. Is a London Underground station in the south-west corner of Acton. The station is served by the District and Piccadilly lines. Central railway station, a London Overground network station. Is the ultimate family club, gym and spa for fitness, sports and relaxation. 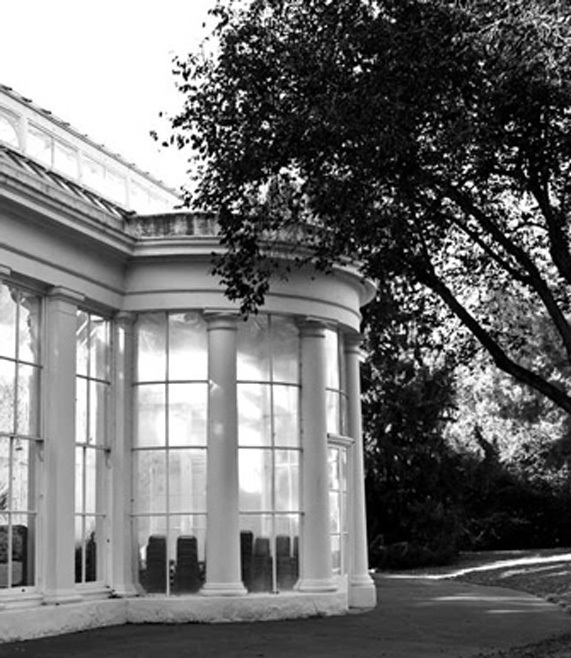 Orangerie, in a setting described by a plaque in Gunnersbury Park as a 19th century landscape. 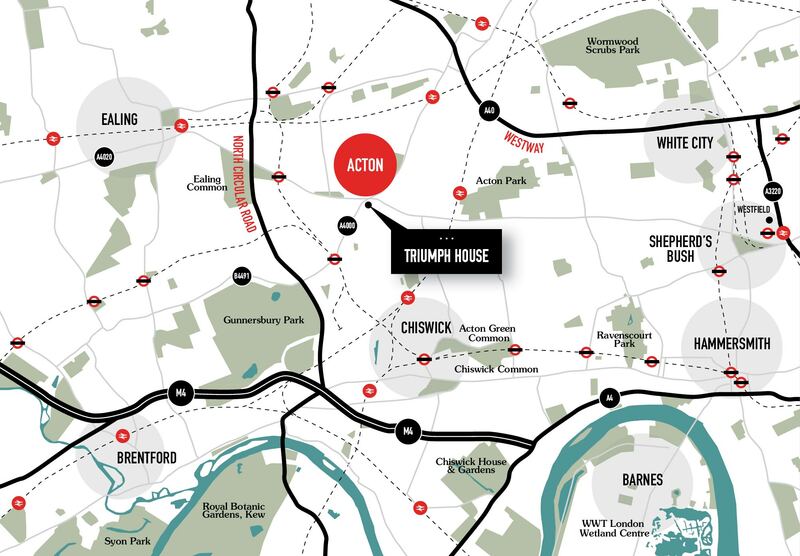 Triumph House is an impressive collection of only 14 apartments, perfectly positioned to capitalise on all that Acton High Street and this exciting part of west London has to offer. 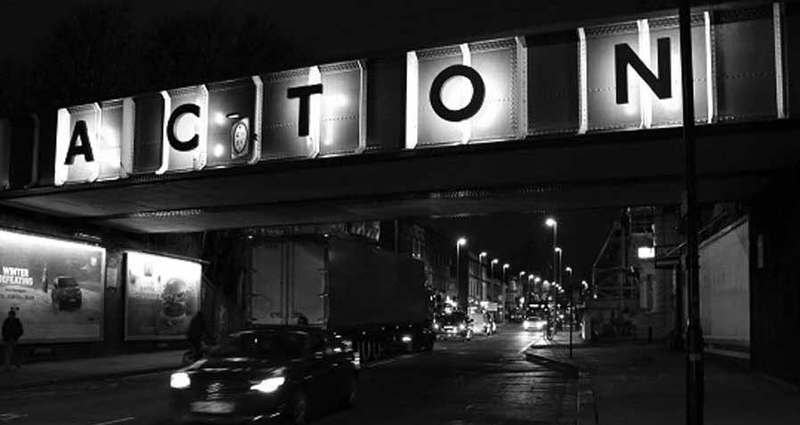 With its excellent connections and eclectic high streets, Acton is a commuter haven, seamlessly combining convenience with urban charm. 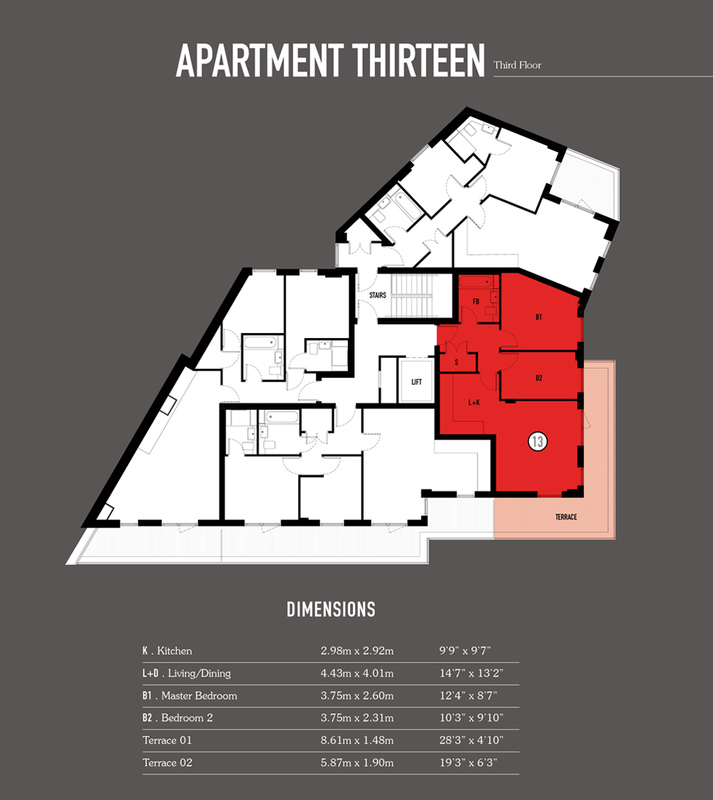 Each of the apartments has been meticulously designed to offer the very best in modern living. From their sleek, fully-fitted kitchens to their contemporary bathroom suites, attention has been paid to every detail. Press & drag each thumbnail to control zoom view for larger details. 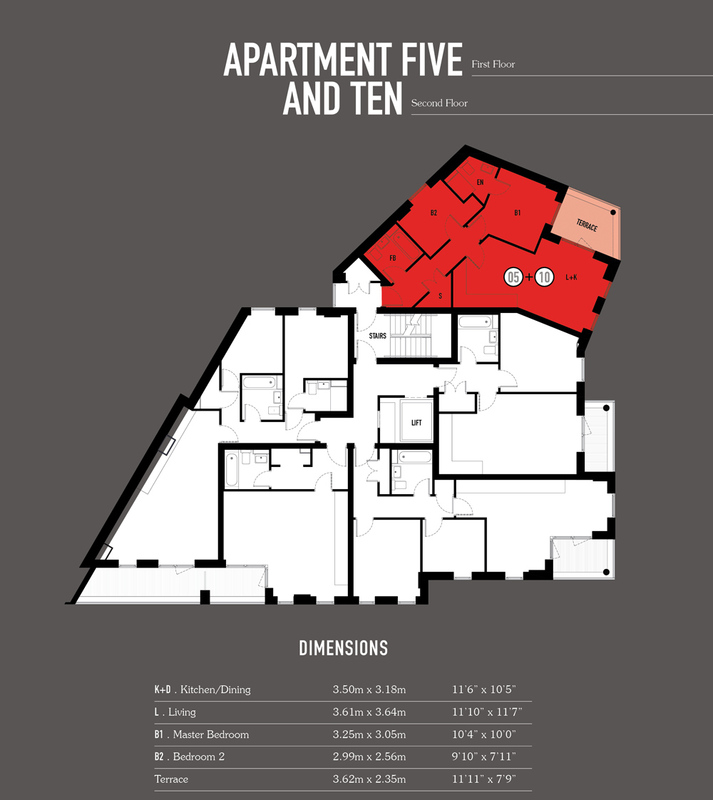 In addition to resident access and a communal area including a lift and staircase, the ground floor incorporates commercial space separately accessed off the High Street. Each of the homes at Triumph House has a high specification, incorporating stylish, contemporary features and high quality fixtures and fittings. Attention has been paid to every detail, to ensure that each and every home delivers to exacting standards. 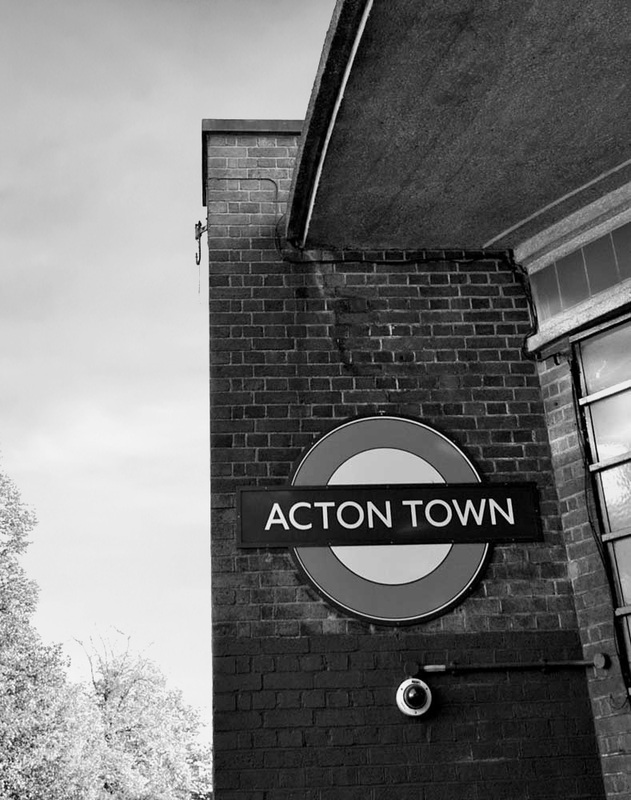 With no less than seven train stations to its name, there is no denying that Acton is well connected. 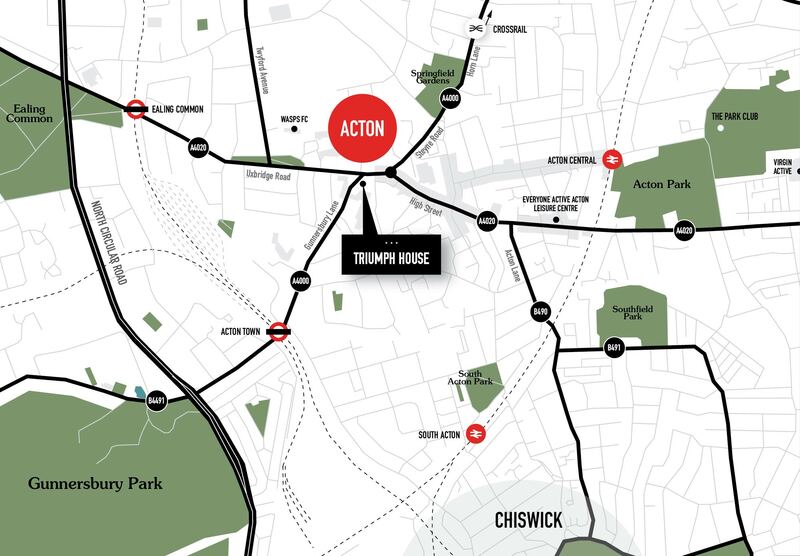 Acton Town tube station is just moments from your front door, while nearby Acton Central sits on the North London Line, providing a convenient, direct route between Richmond and Stratford. In addition, Acton Main Line Station forms part of the new Crossrail programme, meaning the town’s residents are set to not only benefit from an improved station but faster links into central London and beyond. 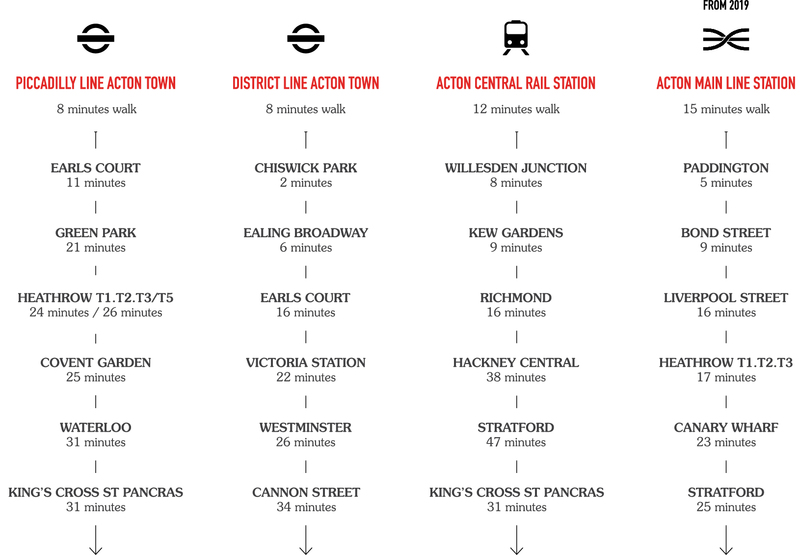 Acton Town Underground Station is only a short walk away (0.4 miles). Here you can access both the District Line and the Piccadilly Line, which will take you direct into central London or on to Heathrow, terminals 1,2 and 3. What’s more, the Piccadilly Line forms part of the new night tube service, with tubes running 24 hours on a Friday and Saturday. As well as its outstanding rail connections it also boasts fantastic access to a road network including A40/M40, A4/M4 and the A406 all within close proximity. Sources: Google and TfL. All quoted times are approximate and depend on time of travel and prevailing conditions. 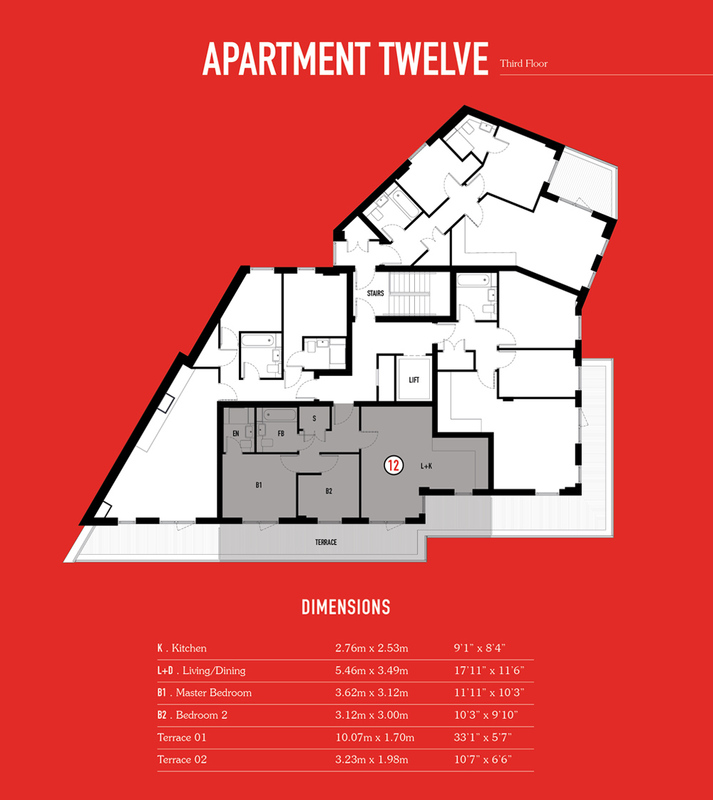 Press & drag each map thumbnail to control zoom view for larger details. Portdevon is an independent, innovative and exciting residential developer, delivering desirable homes across the Capital and the surrounding commuter belt. 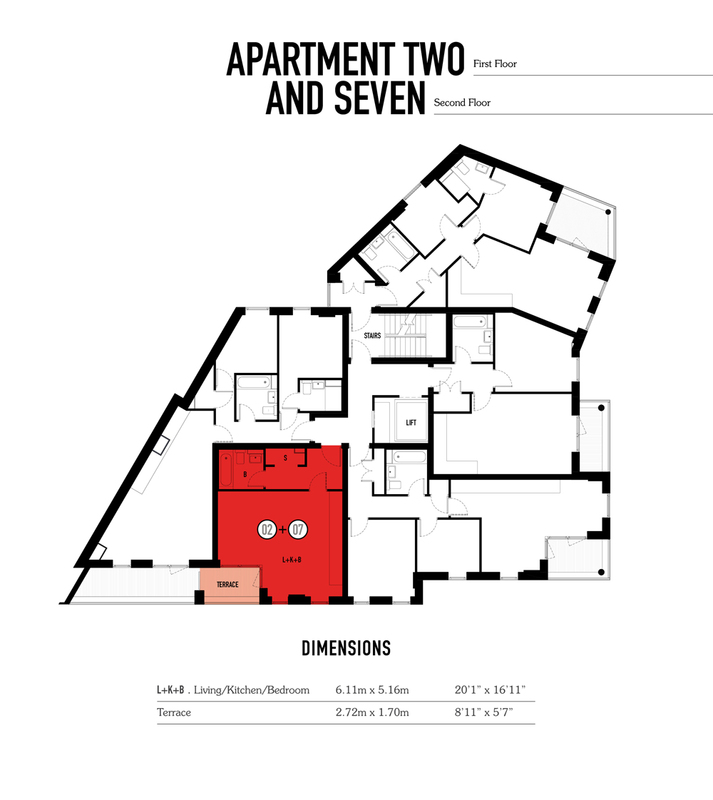 Specialising within the London property market, its schemes are renowned for delivering on quality design and superior finish. These particulars are provided as a general guide of what is being offered subject to contract and availability. These particulars are not intended, nor do they contain, any representation of fact upon which any interested party is entitled or should rely. Consequently this information should be treated as a general guidance and cannot be relied upon as accurately describing any of the Specified Matters described in any Order made under the Consumer Protection from Unfair Trading Act 2008 (CPR), the Business Protection from Misleading Marketing Regulations 2008 (BPR). 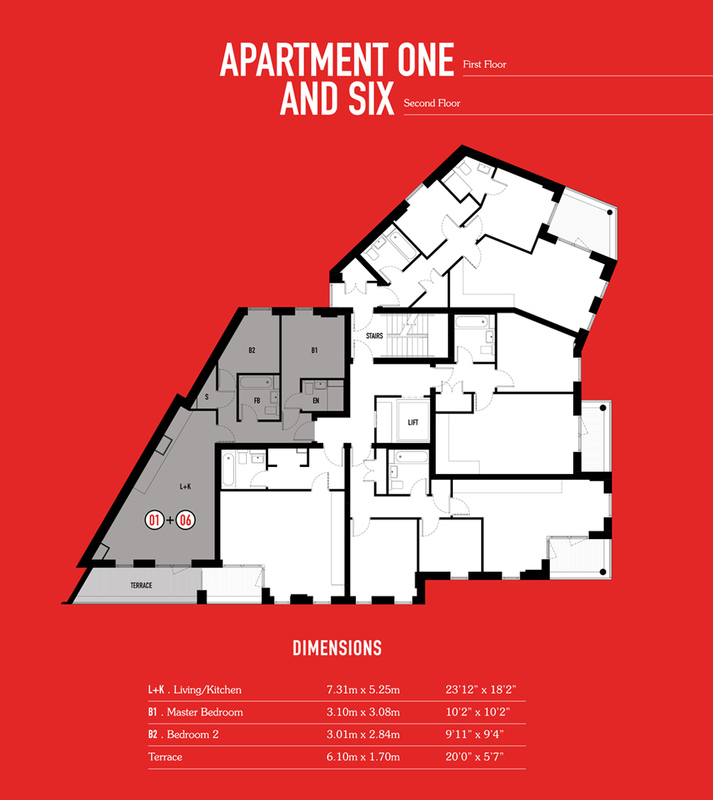 All descriptions, dimensions, references to condition and necessary permissions for use and occupation and other details are given in good faith and are believed to be correct but any intending purchasers or lessees should not rely on them as statements or representations of fact but must satisfy themselves by inspection or otherwise as to the correctness of each of them. 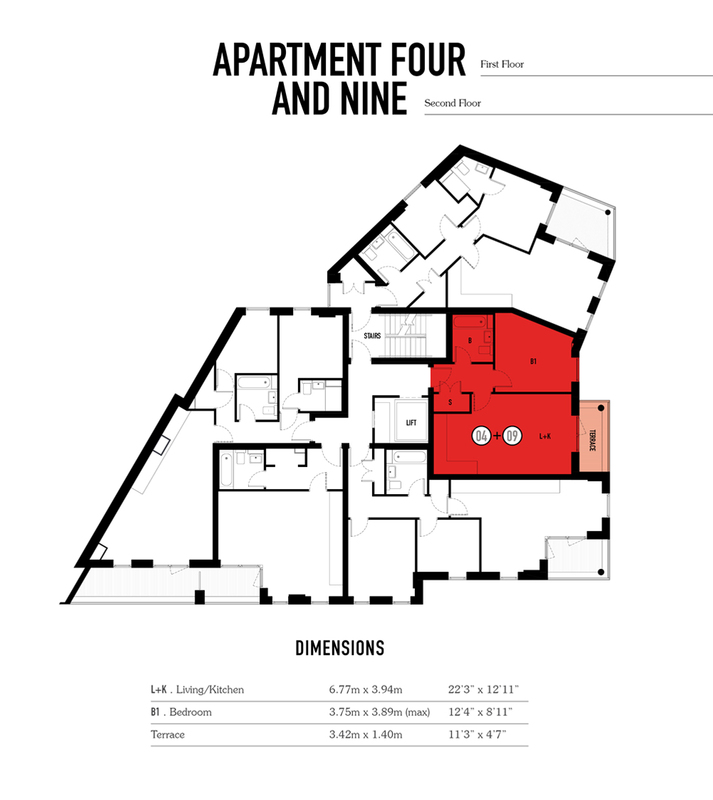 The information provided is intended for illustration purposes only and could change, for example, in response to market demands or ground conditions. No person in the employment of our selling agent and representatives has any authority to make any representations or warranty whatsoever in relation to the property. 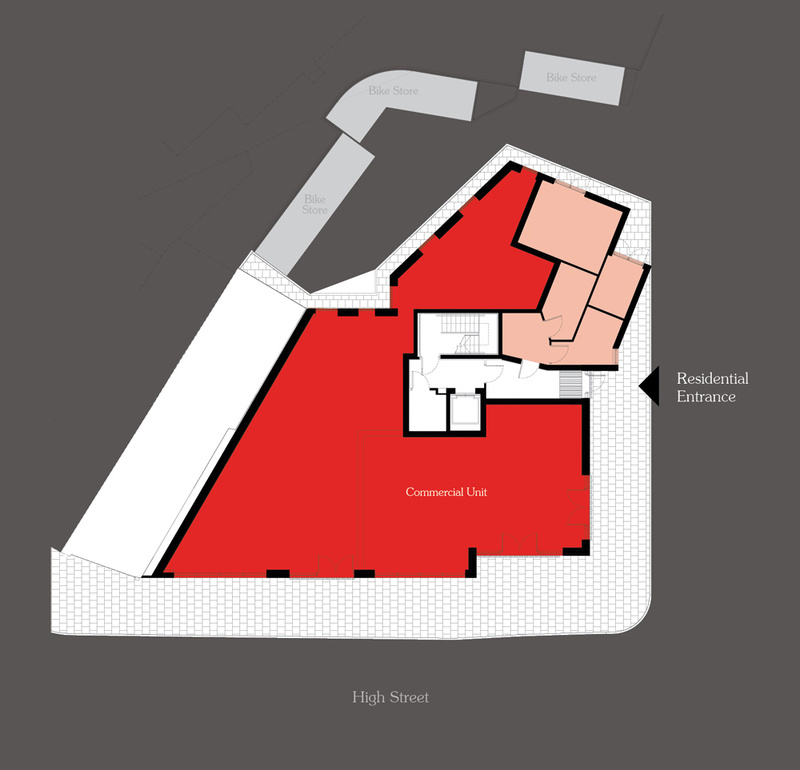 Portdevon property layouts provide approximate measurements and are for illustrative purposes only. 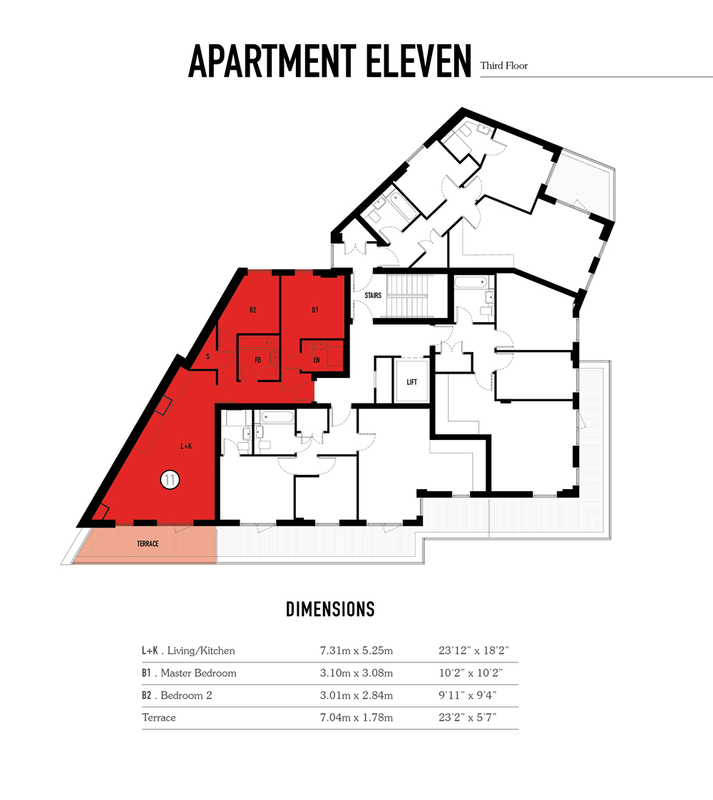 Dimensions are taken from the architect’s drawings and therefore tolerances could occur with the as built product and therefore floorplans should be used as an approximate guide only. Thanks to Tom Dickie and Brian Hunter for supplying information and photographs.